As you may remember, back in 2010 Science is Vital organised a petition to protect the UK science budget. Thankfully funding for science and engineering was ring-fenced and frozen instead of being slashed. However, inflation and cuts elsewhere in the UK government research budgets have eroded investment in science. This is making it difficult for the UK to maintain its reputation for scientific research. In June, the Government will announce its budget for 2015–16. As such Science is Vital has organised another petition to urge the Government to set a long-term target of raising R&D spending to at least 0.8% of GDP. Science is Vital published a letter in the Daily Telegraph signed by over 50 leading scientists in the UK including Stephen Hawking and Brian Cox. You do not have to be a scientist or similar to support this campaign, all you need to help is have some concern about how the UK may loose its world standing as a hub of scientific knowledge. 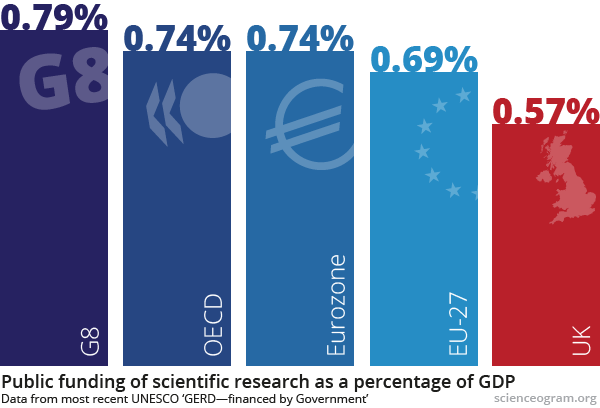 The current UK spend on public-funded research is 0.57% of GDP. The eurozone average is 0.74% of GDP, whilst the EU-27 average is 0.69%.